On a two-disc collection of thirty-four tracks, featuring guest appearances by Jerry Garcia, Richard Greene, David Grisman, Jim Keltner, Bill Kreutzmann, Phil Lesh, and Barry Sless, Chris and Lorin Rowan deliver a warm-hearted, well-written folk record. 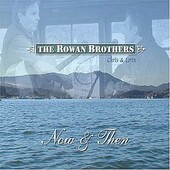 Comprised of well-written tales of life wrapped around rustic melodies and intimate voices leading the way, The Rowan Brothers have created a meditative, gentle record of uncompromising beauty and prowess. Some of the finest folk craftsmen out there today, over two hours of music here will provide you much listening pleasure. I'll give it an A-.